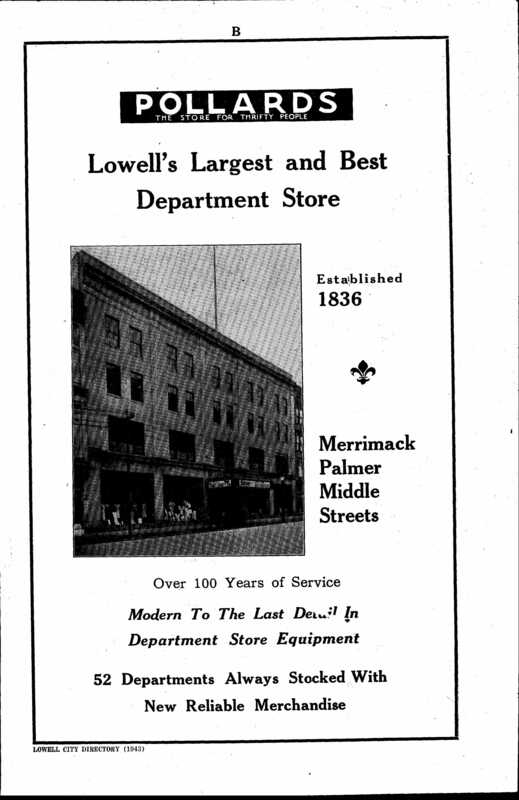 Late on a Thursday afternoon on June 3, 1926, every available firefighting resource raced to Pollard’s Department Store on Merrimack Street in Downtown Lowell. All of Lowell’s fire department was joined by men and equipment sent from Billerica, Chelmsford, Dracut and Lawrence in the fight to save Pollard’s from a raging fire. Pollard’s, also known as A.G. Pollard Co., traced its beginnings to 1836 when Hocum Hosford founded a dry goods store on Lowell’s Merrimack Street, in the same location that would one day house the much larger Pollard’s Department Store. The fire did not result in any deaths, but many firemen were temporarily overcome by the billowing smoke and illuminating gas. Others were cut by flying glass or hit by falling debris. The fire had been discovered at 4:40 PM by workers from the nearby Lowell Electric Light Company. Four hours later, despite firefighting efforts, only the walls remained of the 90-year-old institution known as the A G. Pollard Department Store on Merrimack, Palmer, and Middle Streets. With his entire store gutted by the city’s worst fire on record, many expected 83-year-old Arthur Gayton Pollard to retire from retailing after what had been a lengthy and successful career. Instead, barely a month later, he opened a temporary store, at the Number Six mill of the Bigelow-Hartford plant on Market Street. Just months later, in 1927, he reopened his full store, at its historic Merrimack Street location. Arthur Gayton Pollard lived long enough to oversee the return of his store to full operations. He died on June 4, 1930, just one day after the fourth anniversary of the devastating fire. So great was his reputation among the Downtown Lowell community that the merchants division of the city’s chamber of commerce voted to close downtown stores for one hour on June 6, during Pollard’s funeral. Even the Bon Marche, one of A.G. Pollard’s main competitors, closed in observance of his funeral on June 6, 1930. Arthur Pollard’s influence stretched far beyond his department store. During his working years, he was involved many of Lowell’s companies and institutions. Pollard served as president of Lowell’s Union National Bank, Stony Brook Railroad Company, the Lowell Hosiery Company, and Lowell General Hospital. He was also a trustee of the Lowell Cemetery Association, Lowell Textile School, the Ayer Home for Little Children, Rogers Hall School, and the Young Men’s Christian Association. He was also active in the Republican party. Although he never held or sought office, he served as treasurer on the Middlesex County Republican Committee for nearly 20 years. In 1900, he was a delegate to the Republican National Convention, which nominated McKinley for a second term. Pollard had also amassed quite a reputation in free masonry, and attained high honors in the York and Scottish rites, both in Lowell and nationally. 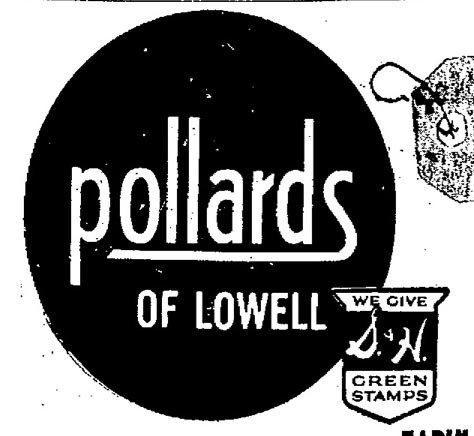 A Pollard’s Ad from 1944 touts its Lowell heritage. Arthur Pollard was a native of Plaistow, New Hampshire. He was born on January 5, 1843, the only son of Colonel Joseph Smith and Luella Josephine (Tucker) Pollard. He moved to Lowell at 11 years old, and, five years later, began working, first with Hilton, Keyes & Lewis of Lowell, and next with the Lowell Board of Assessors. By the time he turned 18, he had found work with Hocum Hosford, a prominent Downtown Lowell dry goods merchant and sometime mayor of Lowell. (Hosford Square carries his name). After three years, Pollard became a partner in Hosford’s firm. Hosford and Pollard continued their partnership for two decades, until Hosford died in 1881. Until 1886, Pollard continued the firm as he had when Hosford was alive, but then bought out his interest from Hosford’s estate and became its sole owner. Arthur Pollard renamed the concern, A. G. Pollard & Co.; his department store was born. By the 20th century’s first years, the A.G. Pollard Company had become one of the largest stores in Massachusetts, rivaled only by a couple of stores in Boston. Pollard became so well-known in Lowell circles that hundreds gathered on Lowell’s Merrimack Street to watch him be the first man in Lowell to drive an electric car. In retailing innovations, Pollard was credited with the invention of the bargain basement. Despite his many successes in Lowell, Plaistow, Pollard’s hometown, was never far from his mind. Over the years, he became known as the “father’ of the town. Some of his many gifts to the town included a tower clock for the Town Hall, a flagpole for the Village Improvement Society, a site for a school building, and an oil painting of his father, Colonel Joseph S. Pollard. He also funded the creation of a soldiers’ monument erected in Plaistow’s Pollard Square. Its pedestal was made of granite and topped with a bronze figure, standing some eight feet in height. The pedestal bears four bronze tablets, containing the names of 102 citizens of Plaistow who served in the Civil War. Pollard’s Department Store held on long after Arthur Pollard’s death. During his lifetime, Pollard admitted his son, Harry G. Pollard to the business, who later succeeded his father as its president. And, in the decades following Pollard’s death, his other descendants played prominent roles in the department store’s management. By 1961, two of Pollard’s great-grandsons, William Pollard Bartlett and Sheppard Bartlett managed the company as its executives. After 133 years of existence and 88 years under the ownership of Arthur Pollard or his family, the store eventually came to be sold on August 21, 1969, to Dexter D. Gould of Manchester, who owned and operated a chain of stores spread across Massachusetts and New Hampshire. At the time of the acquisition, Gould controlled the Miss Lynch Shop, located across the street from A. G. Pollard. He also controlled Lynch Co. of Manchester and Kimball Company in Portsmouth, New Hampshire. As the sale was announced in the local press, promises were made that Pollard’s would retain its name. Sadly, this didn’t turn out to be the case. 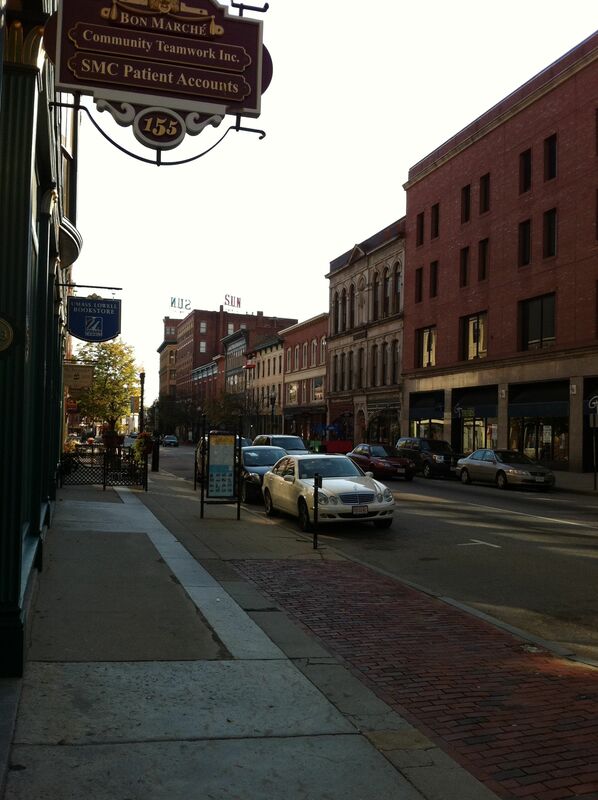 Merrimack Street – Lowell – in Fall 2011. Pollard’s was once housed in the brick building at the immediate right of the photograph. The adjacent Hosford Block stands just beyond. A friend of mine who grew up in Dracut said that Pollard’s / Lynch’s remained open on and off throughout the 1970’s, sometimes under one name and sometimes under the other. When did it finally close? Hi Mike – Lynch’s announced a liquidation sale and that they were closing their Lowell store in August 1972. It appears to be gone soon after and I haven’t found any evidence that they re-opened. The Pollard’s name did live on,though, at least for a while in the mid-70’s, through the A.G. Pollard & Sons Restaurant, which was at the former A.G Pollard Warehouse at 98 Middle Street. ’40s-’50s…Weeks before Christmas (can I say that? ), I remember sitting on the wooden floor in a “huge” room checking out what was written/pictured on boxes of toys. Suspect that must have been like a babysitter…oops, child care worker…while Mom shopped in the rest of the store. Presume Santa sat in that room too. (Wasn’t there a small furrier shoppe next door on the corner of Palmer St.?) Weird…can’t remember what Bon Marche had to offer toy wise. Fuzzily am seeing Bon Marche had the better Christmas themed front windows. Don’t recall seeing people marching/protesting in front of them.